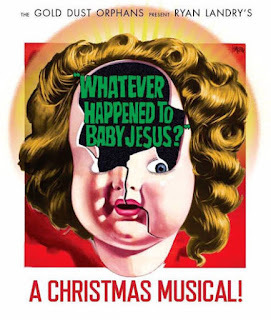 Ryan Landry's Gold Dust Orphans present their new must-see Christmas themed musical mystery production entitled "Whatever Happened To Baby Jesus?" at the Ramrod Center for the Performing Arts at Machine Night Club 1254 Boylston Street in Boston, MA. Opening night is November 30th & runs through December 23rd at 8P. The show tells the tale of somebody has stolen the bright & shiny Baby Jesus from the downtown nativity display & murdered the Preacher's wife to boot but who could it be? Drawing on the cult movie classic “What Ever Happened to Baby Jane?” years pass till Blanche Hudson who is a physically challenged movie star goes to spend the Christmas holidays at the Marvel Family Farm in her hometown of Mapleton, Vermont. But wait! Along comes Baby Jane Hudson her crazy mentally challenged sister & haunted by their pasts the Hudson sisters soon begin haunting each other until no one is safe! Ryan Landry plays the role of Blanche Hudson & longtime Orphan collaborator Larry Coen takes on the iconic part of Baby Jane. Surrounded by a supporting cast of new Orphan favorites the audience is sure to be surprised & delighted as the plot twists & the tables turn. Audiences will not be disappointed in this over-the-top production & can expect to gasp in horror with delight as the Orphans dance, sing & satirize their way through 90 minutes of rock solid fun as "Whatever Happened To Baby Jesus" will keep you on your toes & at the edge of your seat!